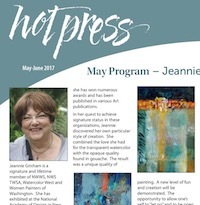 “Hot Press” is the always anticipated full-color newsletter published bi-monthly by NWWS and sent directly to the in-box of all members in good standing. It is filled with current news, artist interviews, important information, event notices, and much more. Hot Press is published in January, March, May, July, September, and November and wonderfully edited by NWWS Member, Jeffrey Waters. DEADLINE: The deadline to have something published in an issue is the 10th of the month prior to its publication. For example, June 10th is the deadline for July’s publication. 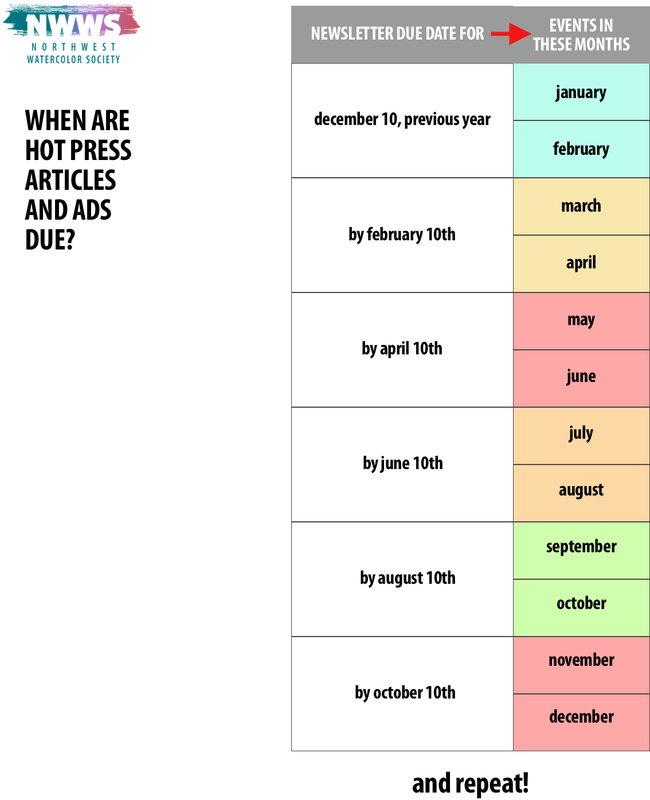 Click to view Hot Press due dates. Click to view HotPress Article & Ad Size Guidelines. The very popular Hot Press newsletter is filled with news and education. We think you’ll enjoy the many past issues we’ve stored right here for you. Enjoy! November 27 - Daniel Smith Store/Seattle: November Splash KATE BARBER, MARY SCHUMAKER, ERIC WIEGARDT & LOIS YOSHIDA. There is no December Meeting. May 29 - Daniel Smith Store/Seattle; Carla O’Connor. Article: Watercolor Essentials, Putting it in Perspective by Donald W. Patterson. Mar 27 - Daniel Smith Store/Seattle;Maria Coryell-Martin. 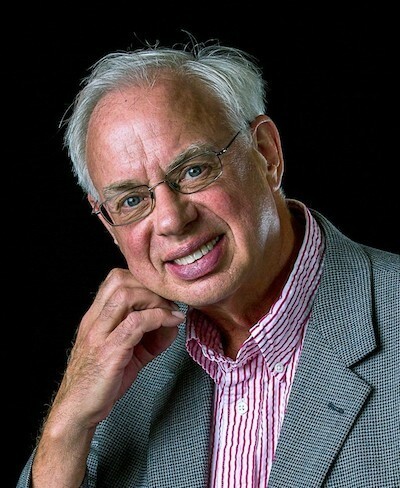 Apr 24 - St. Andrews/Bellevue; Mark Mehaffey. Article: The Value of Watercolor by Laurin McCracken. Jan 23 - Daniel Smith Store/Seattle; Eric Lin; Pizza & Paint. Feb 27 - St. Andrews/Bellevue; Digital Slideshow; Logo Design Submission; Signature Show Special Recognition Recipients; Waterworks 2017 Awards; Watercolor Reading List by Jeff Waters. Nov 28 - November Splash - Jean Pratt Beouy, Molly Murrah, Joe Mac Kechnie and Cheryl Schmardebeck; No December Meeting; "Watercolor Portraits on DANIEL SMITH Iridescent Gold Watercolor Ground" by Molly Murrah; 78th Annual International Open Exhibition - Prospectus available online Nov 12. Nov 24 - Demo-Molly Murrah; December - No Meeting; NWWS Shines in New Cascadia Art Museum. Sept 22 - Demo-Bev Wozwiak; Oct 27 - Demo-Eric Wiegardt; Northwest Watercolor Society Members and Guests Are Invited to an Extraordinary Grand Opening of a New Art Museum in Edmonds, Washington! Jan 27 - Demo-Mareth Curtis-Warren; Feb 24 - Demo Joe Mac Kechnie; Featured Artist - Thomas Schaller on "Light"
May 27 Demo-Anna Roedel; June - No meeting; Waterworks Prospectus. Jan 28 Demo-Carla O'Connor; NWWS Paint-Out by Shirley Jordan; The Competition by Eric Wiegardt. Step-by-Step Art Lesson by Soon Y. Warren; Interview with Artist Paul Jackson. "The Business of Being an Artist-2" by Charlene Collins Freeman; Interview with Artist Nicholas Simmons. "The Business of Being an Artist-1" by Charlene Collins Freeman; Interview with Artist Mary Whyte. May 28 Demo-Lola K. Deaton; Interview with an Artist-Carla O'Connor. March 26 Demo-Molly LeMaster; April 23 Demo-Mark Mehaffey; Interview with Artist Jeannie McGuire. Jan 22 Demo-Kay Barnes; Feb 26 Demo-Cindy Briggs & Theresa Goesling; Interview with Artist Earnest Ward. Nov Demo-Catherine Gill Nov 27; No Dec Meeting. Interview with Artist Charles Reid. January Kathy Collins Demonstrator – Loose paintings done quickly - February Slide show of 2011-12 exhibition entries. Watercolor Reading List by Jeff Waters. November - Dotti Burton, Demonstrator – Abstract watercolor and acrylics; No General Meeting in December – Enjoy this magical season!